By Gary Gamble November 15, 2015 Directors / Indie Cinema / movies / NEWS / upcoming releases to watch out for . 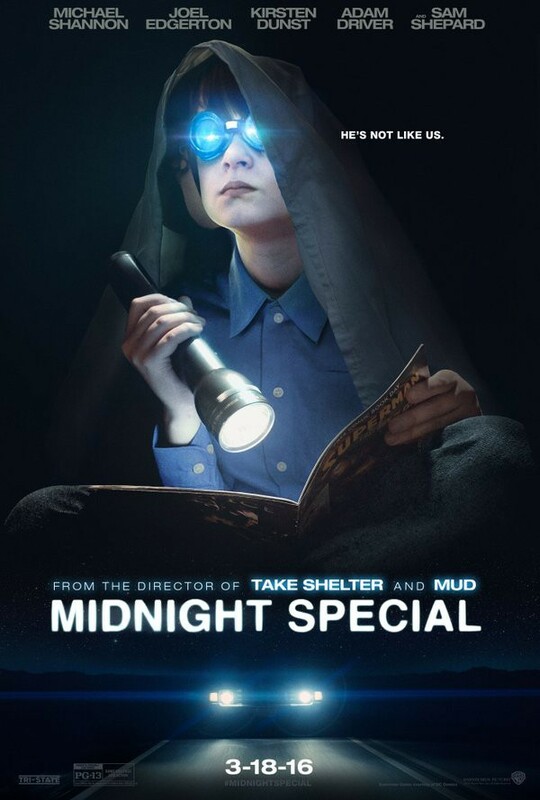 The first poster from Jeff Nichols new sci-fi, Midnight Special has just been released. Nichols was the director of fantastic indies, Take Shelter and Mud. Midnight Special reunites director Nichols and Take Shelter star, Michael Shannon. Roy is a father desperate to protect his uniquely gifted, eight-year-old son Alton. Joined by Joel Edgerton and Kirsten Dunst‘s characters, this group must race to get Alton to a secret location all while being hunted by an extreme religious sect led by Sam Shepard and a government task force headed up by Adam Driver. It is a full-on chase, the outcome of which could bring about a world-changing event. Really looking forward to this film, I was a big fan of both Take Shelter and Mud, both of them great character driven stories with powerful leads. Midnight Special will offer the same again – Michael Shannon, Joel Edgerton and kirtsen Dunst trying to protect a child from a mad religious sect?, that sounds like all the right ingredients for a great, solid indie. DirectorsIndie CinemamoviesNEWSupcoming releases to watch out for .